Hydropower plants are one of the most popular and effective forms of energy production from renewable energy sources. The use of clean energy has a positive impact on the environment (significantly lower CO2 emission) and helps to increase energy security. The biggest amount of energy is produced in the pumped-storage plants. The automated system of energy production in hydropower plants can be entirely based on the iMod industrial computer. The device can be installed in newly build power plants or the ones which are already running but need modernization. iMod can operate as a system of automatic regulation and a telemetry module, collecting data from external devices and sensors. It provides optimum conditions for safe operation of the whole turbine set and at the same time minimizes additional cost. iMod uses a GPRS/ 3G modem together with wired and wireless hardware resources. 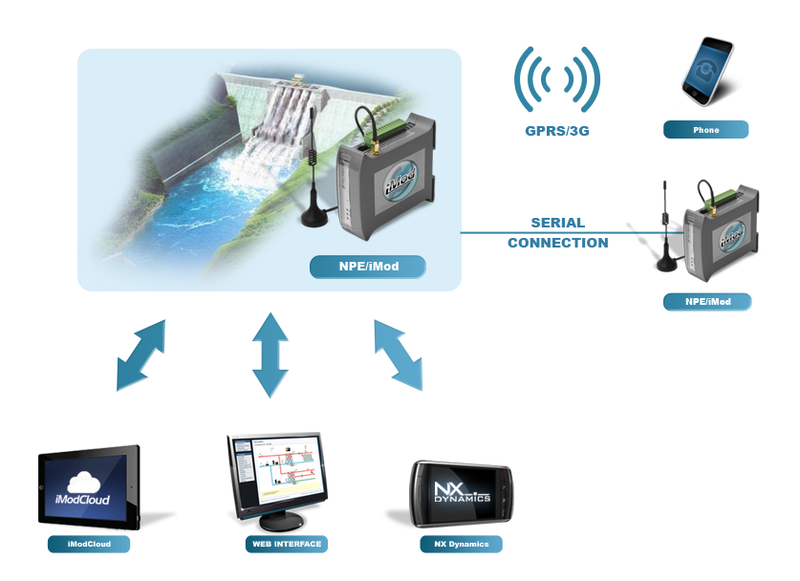 The devices located all over a hydropower plant can communicate wirelessly via ZigBee network - it does not require wiring, makes further system development and reconfiguration easier. Due to data base support and a built-in web server, all the parameters read from external devices are available via a web browser anywhere you are. You don’t need to know programming languages in order to use NX Dynamics dedicated web-based graphical interface - you can create visualization of your system by dragging and dropping selected elements on a chart. System operation control is incredibly simple. The information on operating parameters can be also viewed locally - Modbus protocol support allows you to access data locally. You can connect any HMI panel, which support the protocol. You can control the entire system when there is no access to the Internet. The iModCloud service provides access to all parameters - it enables you to manage electricity generators operation via mobile devices (e.g. smartphones or tablets). iModCloud is particularly useful when there are more NPE/iMod computers in the installation or an administrator is managing several systems. All the devices operate as if the were in one network. Safe VPN connections are used for communication between the devices. We created an intuitive interface, which allows you to create charts with selected operating parameters and to alarms you in case of sudden changes of certain parameters. Built-in GPRS/3G modem allows the device to alarm via SMS or email. All the solutions help to increase efficiency, stability and safety of the whole system. © All rights reserved - TECHBASE Group sp. z o.o.